A WOUND IN TIME: THE HUSTLE IS REAL!!!!!!!!!!!!!!! We will definitely resume filming after the workshop production of one the plays in my trilogy "Wild Child" which goes up on April 24th. 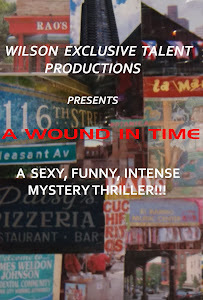 I've been saving every penny to be able to film two full weeks to wrap "A Wound in Time". The wonderful work of the cast in this intriguing story has already garnered attention from Los Angeles and is obviously creating a "buzz" at such an early stage. I am so grateful to all who have helped me and who believed in this socially conscious story.